EAST LANSING, Mich. — Michigan State University trustees moved swiftly Thursday to end the fraught tenure of the school’s interim president, accepting his immediate resignation, naming the school’s third leader in a year and pledging to erase a campus culture that allowed a university physician to sexually abuse dozens of girls and women. The audience at the trustees meeting erupted into applause at news of John Engler’s departure. He has been a controversial leader, appointed a year ago in the wake of the sexual-abuse scandal and assigned to overhaul the university’s culture. Instead, on several occasions, his words offended the victims of Larry Nassar, the disgraced former university sports medicine and USA Gymnastics doctor. The university agreed in May to pay $500 million to settle lawsuits by 332 women who alleged abuse by Nassar. Engler is the second leader forced out at Michigan State within a year. 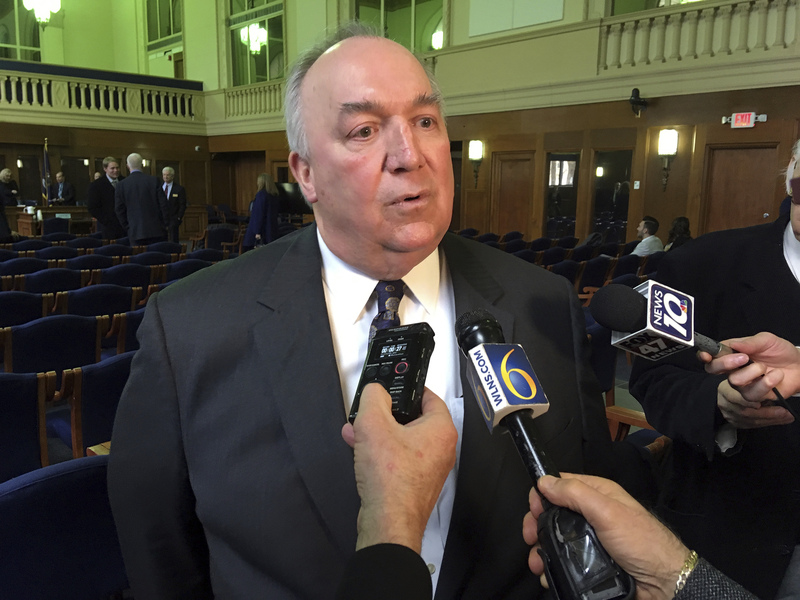 A former Michigan governor, Engler survived a vote to end his term in June. But this week, trustees said they had the votes to terminate Engler following his appearance last week before the Detroit News editorial board, when he said some victims are “enjoying” the spotlight after speaking out about abuse by Nassar, who is serving a sentence of at least 40 years. Satish Udpa, an MSU vice president and former dean of the engineering college, was appointed to serve as acting president. An academic turned university administrator, Udpa has been at the university since 2001. He acknowledged the challenge ahead Thursday. “We can’t continue to operate the way we have been for the past two years,” Udpa said. Cultural change is needed, he said, to ensure respect on campus. Everyone must be treated fairly and humanely, he said, and the environment on campus must help sexual assault victims heal. “That’s the single most important priority for me,” Udpa said. Udpa received his doctorate in electrical engineering from Colorado State University and was a professor of electrical and computer engineering at Iowa State University before coming to MSU. The chair of the board of trustees, Dianne Byrum, emphasized in a statement the importance of sensitivity. “While we collectively are working very hard to make needed improvements regarding the prevention of and response to sexual misconduct and relationship violence, as well as enhancing patient care and safety, none of our hard work will matter if people in leadership say hurtful things and do not listen to the survivors,” Byrum said. At the meeting Thursday, she said Engler’s latest comments brought renewed urgency for a change in leadership. “For every step we took in reforms and to start the healing on campus, his insensitive and ill-advised comments took us backward,” she said. Engler’s ouster was a long time coming for trustee Brian Mosallam, who wrote on social media Wednesday that Engler’s “reign of terror” was over. The appointment of Engler blindsided faculty and student leaders who urged officials to choose an empathetic leader with an academic background who could change the culture at MSU and restore trust at an emotionally wrought time. As anger erupted in the days after last year’s announcement, a town hall was arranged at the university’s conference center. The space was expanded twice as hundreds poured in. Mosallam, the only trustee to attend, took the full brunt of the outrage and pain. “The town hall is what really changed my direction,” he said Thursday. “And took me from listening to the lawyers, to shifting my philosophy to making decisions that are ethically and morally correct.” He said it made him “the lone wolf in the room” at some board meetings until June, when he publicly broke ranks and made a motion to fire Engler, after it was revealed that Engler said privately that a Nassar survivor was getting “kickbacks” from attorneys. In June, Engler apologized for that email, calling it a big mistake. Byrum joined Mosallam in the effort to terminate Engler, but the board voted then to retain him. Since then, the board shifted from a Republican to a Democratic majority, a change that Engler noted in the opening lines of his 11-page resignation letter. Trustee Brian Kelly, a Republican, said there were no partisan motives at play. “I don’t think it’s a Democrat or Republican decision to condemn comments that are not consistent with what we hope to be the values of the university,” Kelly said. Engler wrote that he arrived at a university in crisis and moved with urgency and determination to stabilize the institution, come to grips with the impact of the cascading scandal and change the culture to ensure accountability, safety and respect. He listed changes implemented during his tenure, such as expanding access to mental health counseling, strengthening oversight and swiftly reaching the settlement agreement with Nassar’s victims. Tuition for undergraduates was frozen during his tenure, and he helped the university set enrollment records for this school year’s freshman class, he wrote. “The bottom line is that MSU is a dramatically better, stronger institution than it was one year ago,” Engler said. But some found Engler’s blunt executive style off-putting. Activists who have been calling for Engler’s ouster for nearly a year were buoyant at the meeting. “Trust is starting to be rebuilt,” said Natalie Rogers, a senior who is part of the protest group Reclaim MSU, which says selecting a permanent president is a priority. Udpa said he won’t seek the position, which is expected to be filled by June. “We want to make sure the person the trustees bring is someone who’s willing to engage and listen to the community, and someone’s who’s the antithesis of John Engler, essentially,” Rogers said. Susan Svrluga reported from Washington. Susan Svrluga is a reporter covering higher education for The Washington Post's Grade Point blog. Before that, she covered education and local news at The Post.